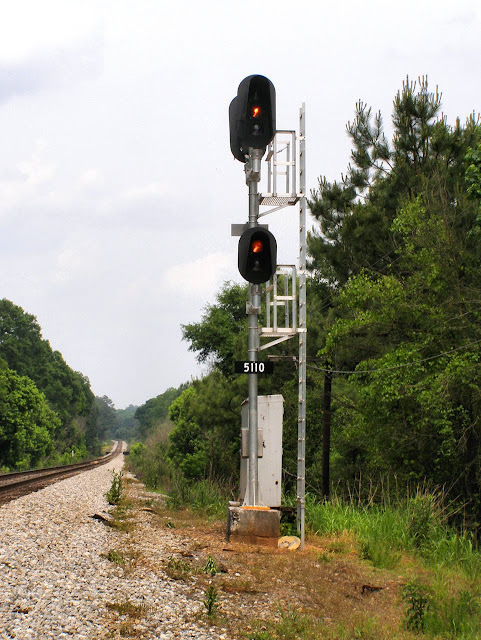 In this week's installment I will travel to Georgia to highlight an interesting development on the CSX Abbeville Subdivision that I discovered while visiting a friend last year and how it ties in with a pet peeve of mine that wound up influencing signaling in the UK. The Abbeville Sub was a former Seaboard Air Line route between Atlanta and the port city of Wilmington, North Carolina. The line is your typical single track CTC with passing sidings and sees only freight traffic including double stack trains. I have mentioned before that the current practice in North America regarding signaling system alterations is to typically replace the existing signaling even if the existing signaling if relatively new with solid state components. My suspicion is that it is easier to test new signals in situ than to try to patch in new vital logic to the older, in service equipment. However every so often there are exceptions to this rule, usually where a single signal is replaced due to structural deficiency or damage. 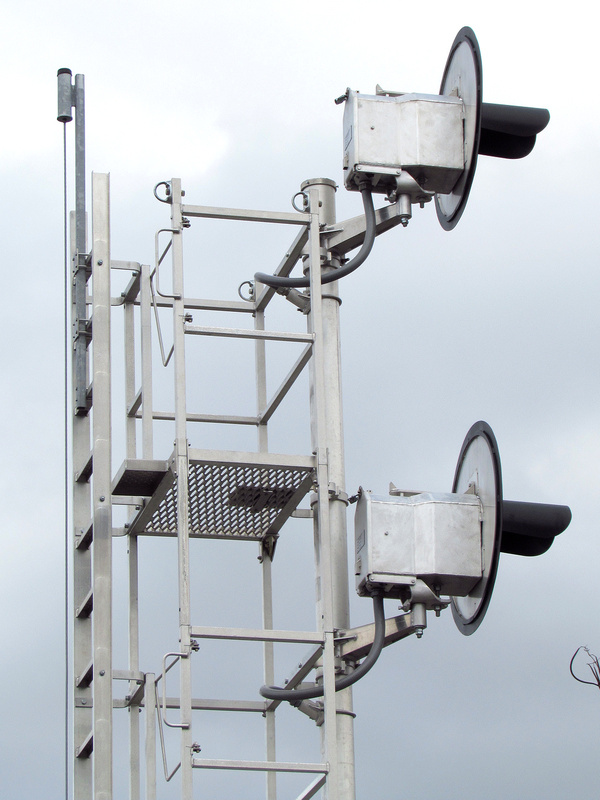 Less frequently single signals will be replaced as part of a change in the physical plant. (And least frequently will the old hardware be modified.) 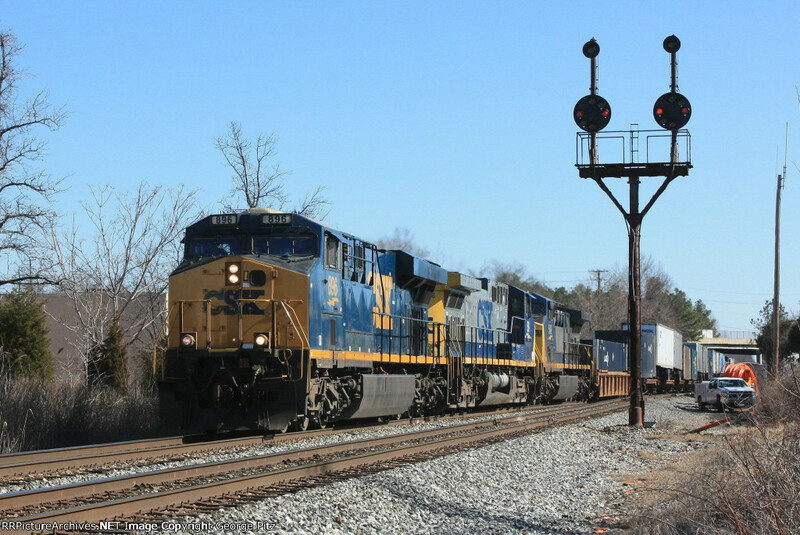 This post is an example of CSX performing a simple signaling upgrade and only replacing the signals that were directly affected instead of everything in sight. The location in question is between milepost 506.8 and 513.4 near Athens GA. The upgrade in question was the installation of a new interlocking at milepost 509.6 to serve a large grain customer so that crews no longer had to operate a hand throw switch. Previously there had been an automatic signal at 510.1, an interlocking at the south end of the Fowler Junction controlled siding and another interlocking at the north end of the siding. The distances involved were 2.3 miles between the auto and SE Fowler and 9,800 feet between SE Fowler and NE Fowler. 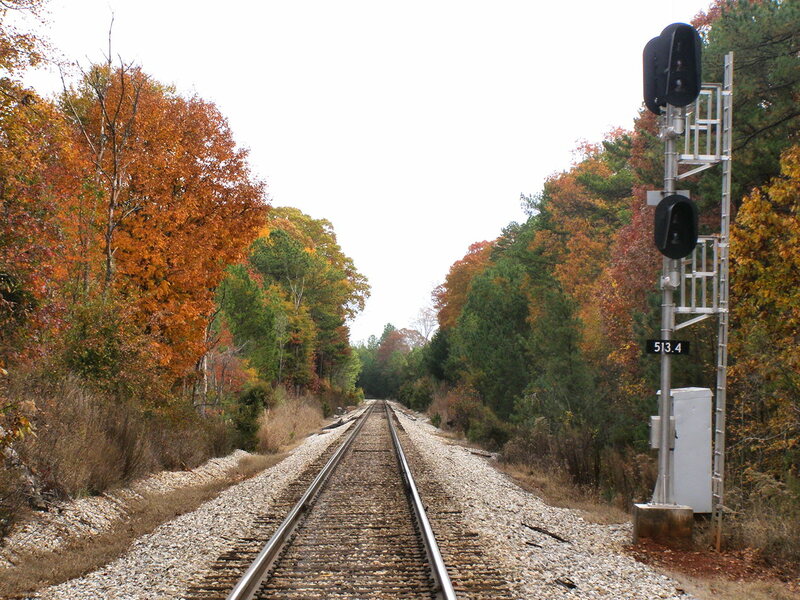 All signaling was of Seaboard origin and dated from the 1970's or early 1980s. On CSX a controlled siding is one with interlocked end points, but no train detection so all diverging moves into the siding receive a Restricting aspect. 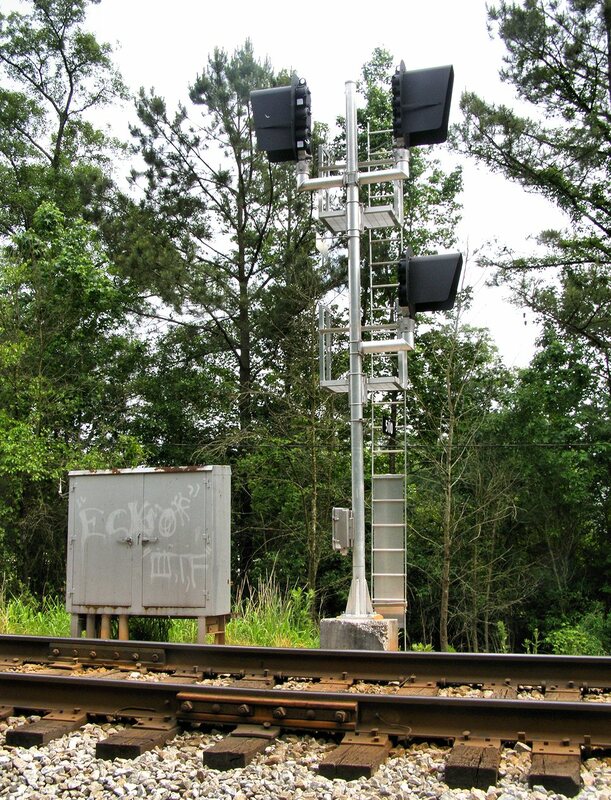 Signal progression for a Restricting signal on CSX is just Approach to Restricting so the 511 automatic could make do with a single 3-lamp head in each direction. However the new interlocking at milepost 509.6 would split the 2.3 mile long block into two blocks of 1.5 and 0.8 miles respectively. While a 1.5 mile block wasn't a big deal, the 0.8 mile block would be too short for a train to safely stop and it was decided to install 4 block signaling on either side of the short signal block. This would require the signals at the 513 auto, the 511 auto and NE Fowler Jct to display an Advance Approach aspect, which they were not set up to do. Now had this been working under NORAC, Union Pacific or Canadian signal rules the change would have been trivial because Advance Approach (preceed prepared to stop at second signal) is represented by a flashing yellow (*Y*). However CSX's Seaboard System rules use Y/Y for Advance Approach. This means a hardware modification to install a second head or, completely new signals and that is what the signal vendor encouraged CSX to do. So here we see the new 5110 automatic signal that I happened to catch displaying Advance Approach. 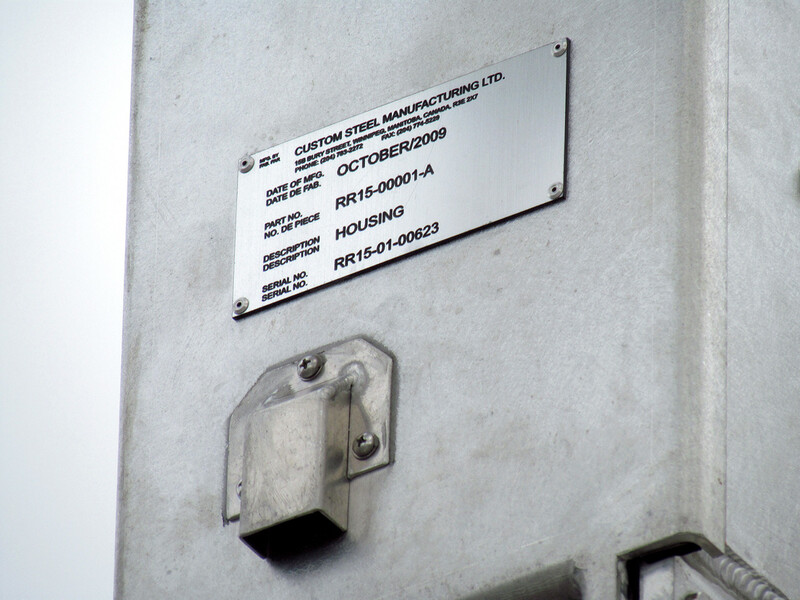 Note the old (P) board at the base of the signal which was used in the Seaboard system to mark Permissive automatic signals as opposed to the more common numberplate. I was pretty lucky to catch the 511 auto displaying Advance Approach as the signal itself is approach lit providing only a brief window of time when a train is in the block where one can catch anything lit up. Aside from the actual signal hardware everything else about the TCB signaling in the area had been left unchanged including the relay cabinet and the original concrete signal base that the new mast appeared to be glued on top of. This is a good opportunity to explain why I dislike the Y/Y advance approach indication. The obvious problem which is demonstrated by this complex patch job is that you have to add an additional lamp or signal head when shortening block lengths instead of just setting the yellow to flash.However from a signaling theory point of view Y/Y Advance Approach makes the signal aspects much less consistent. 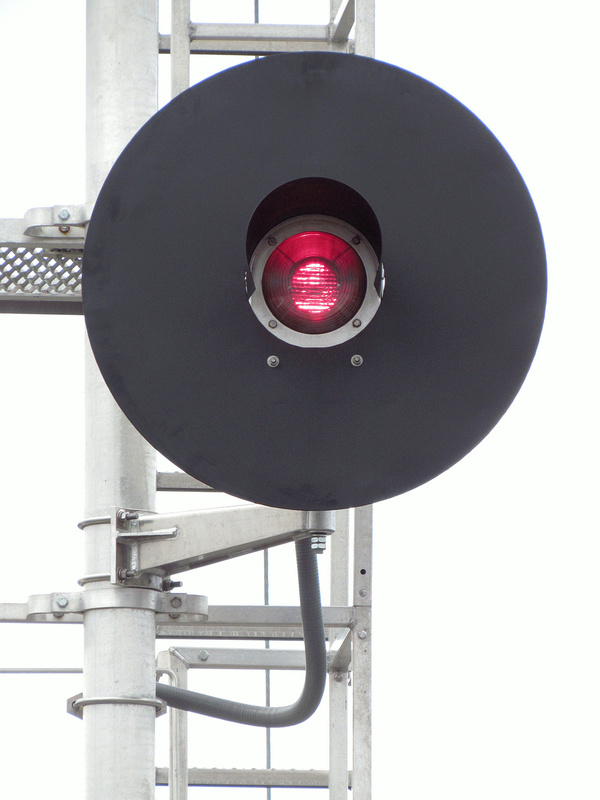 Basic block type signals can no longer all be displayed on one head (or with one lamp). Moreover on CSX Y/Y for Advance Approach displaces what would normally be Approach Slow into a three lamp aspect, Y/R/G. This then serves to dilute the impact of having only absolute signals three lamps as well as disrupting the pattern of the "Approach Speed" series of signals listed below. By stealing Y/Y for advance approach the pattern is disrupted. Y/Y was originally the standard way to display Advance Approach and was actually copied by the Big 4 British railways when that system adopted color light signaling in the 1930's. The reason for this was because at the time flashing relays were both expensive and unreliable, but as technology marched on flashing signals became common and when Conrail was forming what would become NORAC in the 1970's the decision was made to dump Y/Y Advance Approach and replace it with flashing yellows. The real headscratcher is that even if CSX's embrace of Y/Y advance approach precluded wholesale conversion to the two headed style of Approach Speed signals, the Seaboard rules do not currently make use of *Y* for another indication. Much like Conrail did CSX has been free to phase it in ever since it embarked on its massive re-signaling spree starting around 1999. Anyway, in addition to the 511 Auto the 513 Auto also needed replacement to fit Advance Approach due to the now "short" 1.5 mile block between the 511 auto and the new interlocking. Again had *Y* been available all the original signaling hardware would have been able to be left in place. While Timetable and Train Order operation isn't quite dead yet, the "timetable" part of it almost certainly is, even on the one line that officially still uses the system. This is because for all the talk of superior and inferior trains the LIRR does a pretty good job at making sure trains know explicitly when they have to take sidings due to the Manual Block system that covers the more traditional T&TO. Of course that is what I thought until I started going some research on METRA's Blue Island interlocking tower located on their Rock Island division. 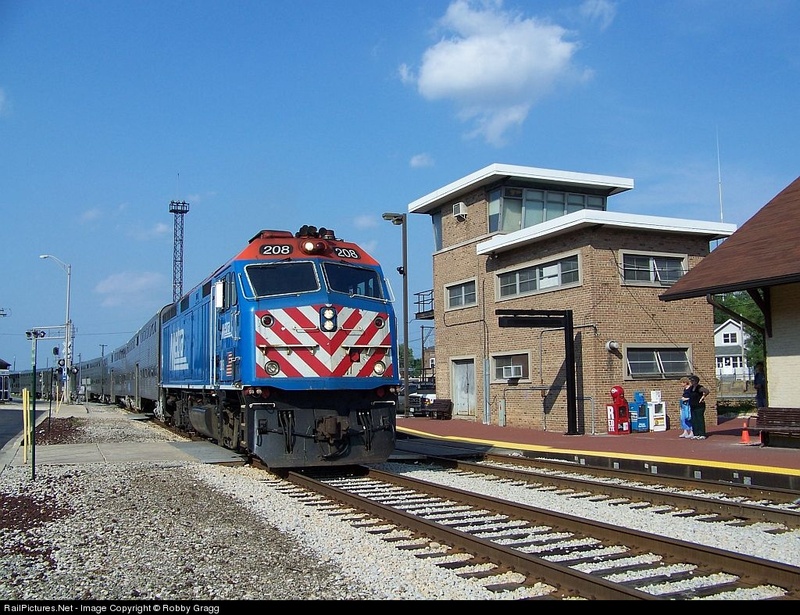 Anyone familiarizing themselves with the METRA commuter network may have noticed the strange lack of any automatic signaling system on the Beverly Branch portion of the Rock Island District. The Beverly Branch is an interurban themed loop off the Rock Island main line that sees the majority of Rock Island district trains save for a few rush hour express runs. Running 6.5 miles from Gresham Junction to Blue Island – Vermont Street about 5 miles of that is not covered by any sort of automatic signaling, which under GCOR means ABS or CTC rules. Of course what the line lacks in signals it makes up for in stations with a total of 10 filling the unsignaled section between the new CP EZLIABETH and the 125th St interlocking. Now unsignaled track, even on commuter rail lines isn't that uncommon, but if one reviews the operating rules for that section you will not see anything pertaining to Track Warrant Control or even its lesser known GCOR cousin Track Permit Control. What one finds instead is Time Spacing, which is defined in a serious of special instructions in the METRA employee timetable. * A proceed indication displayed by the controlled signals governing entrance to the non-signaled territory or verbal authority from the train dispatcher or control operator will authorize trains which have scheduled passenger stops, as indicated in the Employee Train Schedule, to enter and run with the current of traffic in the non-signaled territory. A train must not follow another train until 10 minutes after the preceding train has departed. * Road Dispatcher at Gresham Junction and Control Operator at Blue Island must hold trains at the controlled signals governing entrance to the non-signaled territory of the Beverly Sub District until 10 minutes after the preceding train has passed. They must also notify any train which is followed by a train scheduled to precede it. * Trains not indicated in the Employee Train Schedule as operating via the Beverly Sub District and trains moving against the current of traffic will be authorized by track permit after an absolute block has been established in advance of the movement. What we have here is a somewhat informal version of timetable operation which keeps the time separation components, but discards many of the issues about actually keeping to your assigned schedule. Only scheduled trains may enter the time separation area on signal indication, but it doesn't matter what that schedule is or if they are following it. The rationale behind this the high density of stations which all trains on the line must stop at. With stations less than one half mile apart each there isn’t much room for trains to build up a dangerous amount of speed and it is not difficult to observe any traffic running on the line ahead. Even with the frequent station stops and a 30 mph maximum line speed, a second layer of safety is provided by the operators (now dispatcher in the case of Gresham) who cannot display a signal into the time separation without waiting 10 minutes since any preceding train was admitted. This time separation requirement applies for trains within the block which cannot depart a station any time sooner than 10 minutes after the preceding train has departed. The signals at both entrances to the section can either display some version of Clear and Restricting, so just like in manual block systems the Clear served as a manual block proceed indication that is valid all the way to the next interlocking, unless the train is held up by the at station 10 minute rule. At the new CP-ELIZEBETH (replacing a portion of the old Gresham Junction interlocking) you can see the proper direction track westbound signal can display G/R on the upper head and R/L on the lower. The reverse track can display G/R/L on the lower head. While in theory time separation could be employed equally well on a bi-directional scheme with admittance to the blocks governed by the operators/dispatchers at either end, in practice all reverse direction moves must get a track warrant. Moreover all non-scheduled trains must also get a track warrant as no scheduled train skips any stops and the station stops serve as safety critical time checks. Unfortunately all these stops come at the cost of timeliness with the 5 miles in the un-signaled territory taking upwards of 20 minutes to traverse according to the schedule. That means that the line would not do much worse if it was simply converted to Yard Limits and trains run at restricted speed (although you might not be able to make any stops). In terms of train frequency the shortest headways on this line are 13-14 minutes apart, although to handle the peak traffic other trains can be sent via the Main Line with its full CTC protection. In advance of each exit interlocking, CP-ELIZABETH to the east and 125th St to the west, there is an automatic distant signal allowing the block in advance of exit interlocking to be run under ABS rules. The setup is reminiscent of Amtrak style Rule 562 operation with cab signals with fixed waysides only at distant. 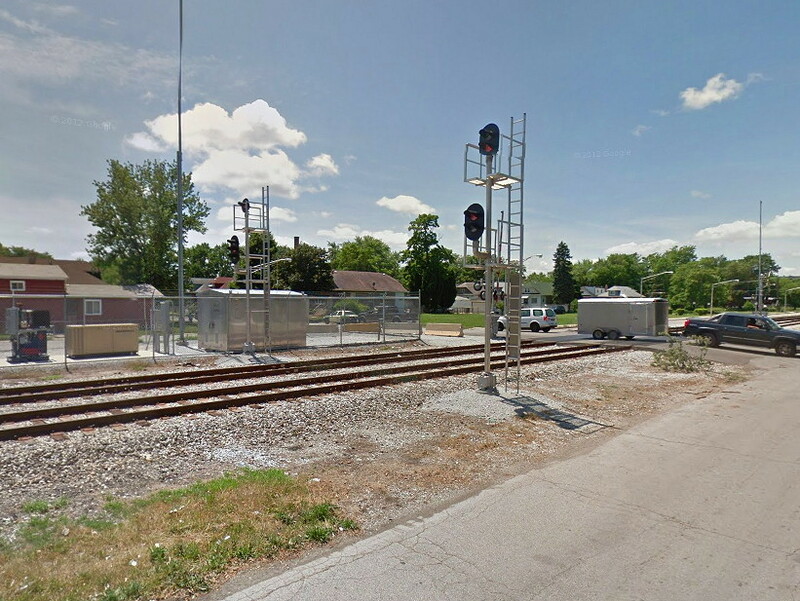 The history behind why this stretch of line was left signaled the way it was is a bit of a mystery, especially considering that the Rock Island was the first to make use of RTA funds to improve its service. One probably culprit are the large number of grade crossings in the Beverly Hills section of the line with 24 being located in the unsignaled section. Automatic crossing protection using DC track circuits would have required complex logic when combined with automatic block signaling. Demands from the time to improve crossing protection or an effort by the Rock Island to avoid paying crossing tenders may have lead to the discontinuance of automatic signaling in that area. The practice may have also evolved from older manual block or timetable operation that was never upgraded due to the slow speeds and frequent station stops. How much longer this practice will continue is a matter for speculation. The Rock Island district is already targeted for a pilot PTC system and such dark territory is the thing that PTC generally eliminates as part of required signaling upgrades. However PTC could be used as an overlay to provide actual enforcement of the current time separation and remove any necessity for track circuits on this stretch of track. The time separation rules would of course probably be left in place for when the PTC system inevitably doesn't work. Time for another post grouping all of the recent signaling news. As always CSX is re-signaling something and this season their cancer has spread to the Philly Sub with new signaling going in between ROSSVILLE and the Van Beibber siding. Automatics appear to be included as well including the late model pair between ROSSVILLE and BAY VIEW. This is a bit sad as ROSSVILLE was re-signaled about 10 years ago and the autos were converted to modern audio-frequency circuits about the same time. The Van Bibber siding is still relay equipment so I guess its not surprising. 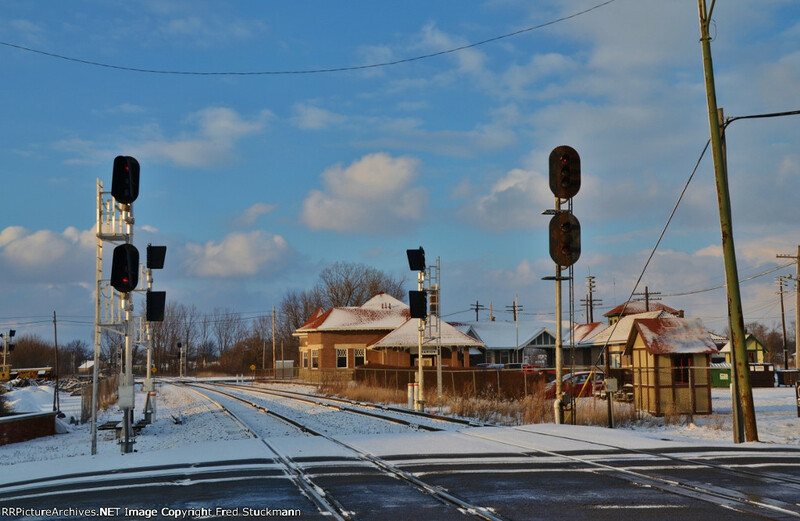 Staying with CSX new signals are up on the former C&O main line at Fostoria which had remained a breath of fresh air ever since the B&O main line re-signaling in the late 1990's. However it seems that the reprieve is up, even for the C&O aspect Darth Vaders. Its a CSX Hat Trick as I learned that the new signals on the C&O Main Line between MX Cabin (Hinton yard) and Alderston were just cut over so there is increasingly less reasons to take the Cardinal to and from Chicago. Moving down south we find a major re-signaling project in the Birmingham area as the 32nd St interlocking complex is going under the knife from NS. In this case the signaling itself may be getting more interesting as the original Southern plant was rather minimalist, but the new Darth Vader heads are just as bland even if they are displaying new aspects. Also going are R/ / Y restricting indications which are somewhat special. If you life down there use the convenient grade crossing to get some closeup pics. This follows the re-signaling of the re-signaling of the large 3x2 diamond crossing at 14th St.
Last August I reported on a strange type of searchlight signal being installed by Canadian Pacific. Canadian Railroads had, until recently, been supporters of the searchlight signal style switching to Unilens and 3-color LED's as electro-mechanical searchlights fell out of favor. Well, Unilens signals had always gotten a bad rap when it came to beam intensity and I noticed that in pictures of the new signals around the Mechanicville Yard complex that what was being installed didn't look familiar and also, from external reports, were quite bright. Well, I finally up to the area to check things out. It turns out that these searchlights are indeed not of a traditional type or made by a traditional manufacturer. While they roughly look like old school searchlights the housing is quite a bit larger and unfortunately did not provide any clue to the type of mechanism inside. A closeup of the builders plate shows that these aren't even made by a signal vendor, instead a custom steel housing outfit in Manitoba. So it looks like for a time CP was going in house to supply its signaling needs. If these were to more reliably house old school searchlights or a new housing for some sort of LED based unit perhaps using a mirror system I do not know,, but I suspect I will find out eventually. Looking down the barrel there appear to be LED elements behind the traditional focusing lenses, which is not surprising seeing that CP has now flipped to bare LED Darth Vader units. unfortunately while some light was shed on these mystery searchlights I unfortunately discovered another variety at CP-448 on the Guilford Freight Main Line in Eagle Bridge, NY. Oh well, give me something to do the next time I am in the area.